As a homeowner, your monthly utilities are often a significant expense. Expensive energy bills take a toll on your monthly budget, but there are simple solutions to cut back on your utility bills and increase your home’s energy efficiency. Below, you will find four simple ways to save money each month. Although small and unobtrusive, the light bulbs you use throughout your home are responsible for a large percentage of your home’s wasted energy. This is especially true if you still use incandescent bulbs in your major light fixtures and appliances. 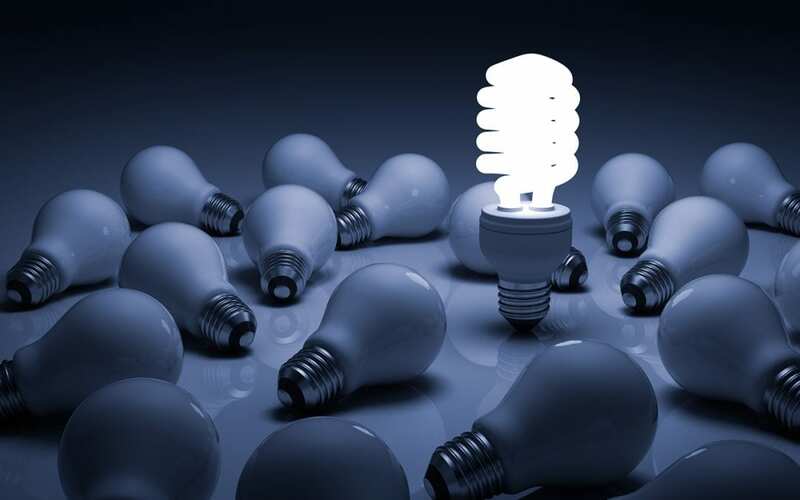 Incandescent bulbs convert around 90% of the electricity they consume into heat rather than light. You can see a yearly savings of over $75 a year if you change five of your most frequently used light fixture bulbs to LED (light-emitting diode) bulbs or CFL (compact fluorescent lamps) bulbs. These bulbs not only fit most of the light fixtures inside of your home, there are also bulbs specially designed to fit the outdoor fixtures of your home so that you can increase your home’s energy efficiency on a larger scale. A skylight is a popular addition to many homes, though most homeowners want a skylight for aesthetic purposes. A skylight helps open a room by allowing extra light to enter and brightens the darker areas with natural light. They can also provide natural solar heat during the cooler months, which helps increase your home’s energy efficiency. South-facing skylights will work the best for this purpose. Choose an ENERGY STAR skylight to prevent any heat or A/C from escaping. One of the first defenses your home has against losing heat or cool air is the insulation within the walls of your home. Insulation begins to lose its ability to perform its necessary function as it ages and deteriorates. Upgrading your old insulation with new materials can be an incredibly beneficial way to increase the energy efficiency of your home. New insulation can help prevent cold drafts from entering your home during the winter months and keep cool air inside your home during the summer months. Once your home is protected by a layer of new insulation, you’ll likely notice a dramatic decrease in the amount of energy your furnace and air conditioning unit requires to keep your home at a comfortable temperature. It may surprise you to learn that a lot of your heat and cool air can be lost through your windows. Completely replacing your windows is an expensive option that’s well worth the cost if it’s within your budget. If not, an affordable way to rethink your windows for increased energy efficiency is to simply change your curtains. While light, sheer curtains offer much in the way of increased light and improved aesthetics, they can also prove to be insufficient when it comes to preventing cold drafts during cold months. Rethink how you accessorize your windows and choose heavy drapes that have a thick lining that can prevent drafts during the winter and keep heat from entering your home during the summer. AAA Home Inspections provides home inspection services to Central and Northern New Jersey. Contact us to book your next home inspection!